It was a day of dedication and celebration as friends and honorees gathered to observe the opening of our new Headquarters Building, on Thursday, July 11. Two years after breaking ground for the new facility, the 21,000 square-foot structure was ready. With staff and volunteers on hand to welcome well-wishers, the doors were opened to friends eager to tour the new building and share in the excitement. The Most Reverend Robert J. Cunnigham, Bishop of Syracuse blessed and dedicated the building and concelebrated a Mass of Thanksgiving with Monsignors Robert Davern and Monsignor Ronald C. Bill. Clergy from local parishes were also concelebrants. The day’s events were highlighted by a ceremony honoring Monsignors Davern and Bill, past Executive Directors of Catholic Charities of Broome County. Plaques of the Monsignors were unveiled, which will hang in the East and West Wings of the facility in honor of their outstanding service to our organization. 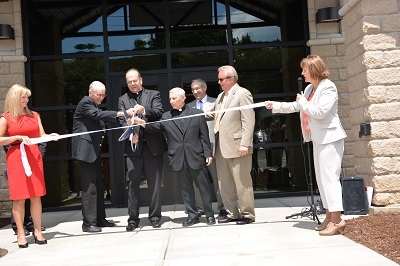 The dedication of the building wings is a fitting tribute to two special and beloved priests who have touched the lives of so many at Catholic Charities and throughout Broome County. The Grand Opening Celebration concluded with building tours, which allowed participants to view the Giving Trees located in the Main Lobby. One tree acknowledges major donors to the Capital Campaign (Rooted in Tradition: Building for People of All Faiths). Another tree honors parishes that supported the campaign. In addition to the Giving Trees, areas and rooms in the building have been named in honor of organizations, businesses and foundations whose generous donations supported the Capital Campaign effort.